What's up with the Walkers? Life on the Palouse: I'm back!! I hope you all have enjoyed the last couple posts mommy has posted but I know the real reason you all come to the blog is to see ME!! Little Miss Olivia. So I figured I would take over for mommy and give you all an update on what is going on with me. Mommy's Day was a couple weeks ago and we had a lot of fun. I am very lucky to have such a great mommy. She always plays with me and makes me giggle and takes very good care of me. Below is a picture we all took on Mommy's Day. 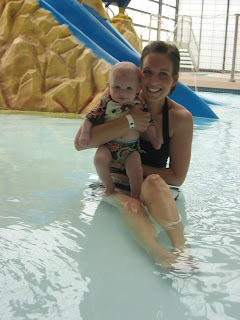 Mommy and I went swimming a couple weeks ago. We went with one of my friends McKenna. We had so much fun. I was a little scared of the water at first but now you might as well call me a fish! I've moved up to rice cereal! At first I didn't know what to think of it but after I learned how to swallow I liked it. Mommy thinks it tastes like water but I think it tastes like candy!! I guess I don't know any different. I'm a very good eater and I'm putting on the pounds!!! I'm getting so heavy that it is harder for daddy to keep me balanced on his hand! I will be 6 months old soon. Mommy says I'm a chatter box. I'm also rolling over, sitting up, and giggling. I love to learn new things. I hope you are all well and I'll be back soon. Heather - you are one hot mama!! Your dress is beautiful! And I can't believe little Olivia is getting so big - she is so cute!!! She looks like a perfect mix of the both of you!! Miss you lots! Olivia just keeps on getting cuter and cuter. But what do you expect?? Looks like you guys are having fun being parents. Cute Heather. We really need to get together soon. She is getting so big. I hope things are going good. Oh! I forgot to tell you. Emily had her baby! 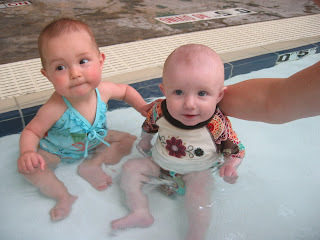 Go to my blog to look at some pictures... she is so cute. YOu look so cute in your "Mothers Day" family pictures. Olivia and Lucy basically have the same clothes so I am loving looking at your pictures.